Where Have We Been? What’s Up Next? Project Status! many of you might have noticed that our website disappeared. Unfortunately, this was due to Ubisoft notifying us that we would infringe their copyright with the images on this website. That’s why our website was offline for a long time and now does not contain the cool screenshots of our unofficial remake any more. I hope the changes I made are enough that Ubisoft is OK with this page now. If not, please notify me again (I wasn’t able to get more details from your side). So, while these struggles combined with my masters thesis put a hold on my development efforts during the end of last year, we are now back working again. Thanks to the contributors that kept submitting cool new features and improvements building quite a pile of work for me ;). Ships! Thanks to @rpolzer, the ships are on a good way and thanks to @jaschaio, we will also get our own ship images!! 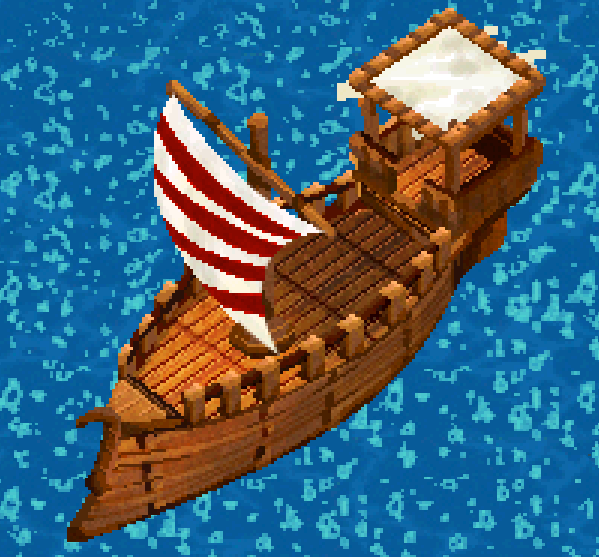 This is a very important thing since the Amazon demo does not include all the required ship images. I added one of the ships below. However, the creation of these ships takes a lot of time, so this feature will still need a bit of time. If you know a 3d artist who’d like to help us, please get in touch with me! Sorry for the delay in everything and that our page was down so long. We hope to bring you new features soon. A new and completely rebuild Android App. Special thanks go to Tom Pratt who developed most of it! 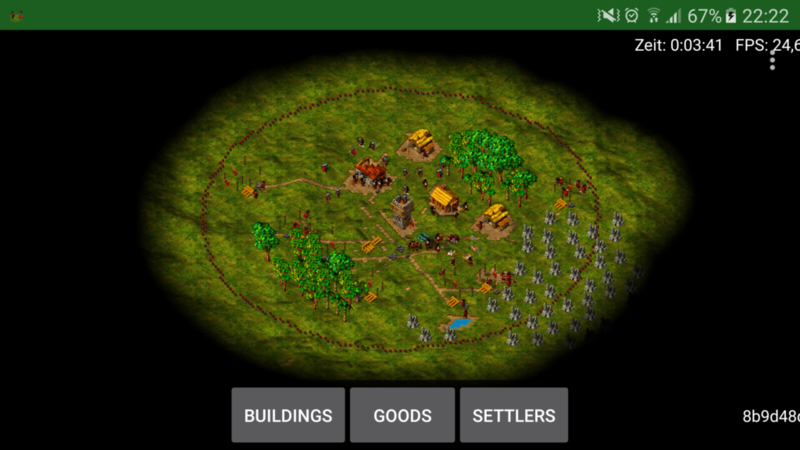 The new UI doesn’t look like the original one you’re used from the PC game but was adapted to fit to Android devices. Please note that the UI is, as always, not completely finished and will be subject to change. Please see our new Android User Guide on how to use the Android UI. The AI opponents have also improved a lot again. The AI is now using pioneers to expand its territory even faster. The stock building has been added. You can now store materials in the stock and configure what to stock either globally (via the menu known from the original game) or locally when selecting the stock building and configuring it there. The AI uses the new stock building to store gold and by this improve its offensive combat strength. Now, you can also configure the tools and weapons to be produced manually. The system will automatically produce the tools needed to create required workers. But if you specify a fixed number of tools manually, those will be produced first. If you specify a distribution for the tools, this will be considered with the lowest priority to ensure all your workers get their tools first. The menu to see how many settlers of each type you have, has been added. The sound has been improved a lot in the desktop version of the game. And of course several bugs have been fixed as well. Also, as requested by many of you, I opened up a Discord to make it easier for you guys to get in touch with us. And of course there is also a channel to find other players to meet up for multiplayer matches. You can find more information about how to get in touch with us and where to report bugs on our new Contact Us page. Now where can I get this awesome game?? On our new Downloads page! There you can also read about how to get our nightly builds with the newest features (and bugs 😉 ). We will continue improving the Android App (there are already Pull Requests for this in the pipeline). We plan on replacing our OpenGL wrapper for the desktop version of the game. The reason is that JOGL (which we currently use) isn’t developed any more and causes crashs for some of our players. That’s why we want to switch over to LWJGL. If anyone has experience with this stuff, feel free to join the corresponding Discord channel. From what I saw, ships are also in the making by one of our newer contributors. So thanks for your interest in the game and our work! We’re looking forward to your feedback and please like and share this with your friends so they can find this project, too! After far too long time, I finally managed to get a rework of this website done to make a bit more modern and mobile friendly. I hope you all like the design. As always, if you find a bug, let me know 😉 . Many thanks go to Diana Tischler for her help. I know the last update was quite a while ago, so I wanted to teaser you the next incoming update! As some of you might have already seen on Github, Tom Pratt is investing a lot of work into our Android App to finally make it playable again. Some of you we’re always wondering, why we didn’t use the same user interface for Android as we use for PC. Well, that’s mainly because the buttons would be to tiny on a phone and thus make it hard to play the game. We then started to create an new UI for it but didn’t get far before Michael didn’t have the time any more. While Tom is finishing up some stuff on this major change, you can follow the progress on Github. Besides that, the AI also got a major update allowing it to utilize pioneers making it even harder to fight against it! New main menu for the Windows, Linux and Mac OS version! The new main menu allows for choosing your own start position and the strength and number of your enemy AI players in single player mode. For multiplayer, these features aren’t ready yet. You can now play maps from the original The Settlers III game in our remake! Better AI! The AI became even stronger and got rid of its end game limitations. You can now see it building 70 and more weapons smiths! Market and dokeys have been added. Minimap has been added in the Android App. New user interface for our map editor to make it even easier to create great maps! Tower soldiers can now be set / released from the tower. In order to make it easier for new players to get into our game, we’ve written a small guide. Especially, the shortcuts section could be of interest for most players. To reduce the waiting time for the ones that cannot compile the newest version themselves, we plan on providing nightly builds. Of course they won’t be as stable as these releases, but you’ll get the newest features. I will keep you updated here, when this becomes availble. As always, have fun with the game and share this with your friends, so they can have some fun too! PS: I’ll not be able to work on the project for about a month from now. So don’t worry, if you don’t see that much activity from my side. I’ll be back soon! First of all: Happy New Year 2016 and thanks for your support and interest in this project during 2015! I also want to say: Many thanks to all the contributors who helped to bring this game a huge step forward! Speaking of which: The new Alpha Release v0.2 is out with our brand new AI! Many thanks go to Stephan (@codingberlin) who developed this great feature. To play with AI players, you can simply start a new single player game. All other players on the map will be AI players. One important thing to mention: We have four AI difficulties at the moment. As our main menu UI still lacks a lot of features you currently cannot really configure the AI difficulties (there is a way via a configuration file). Nevertheless, to give you guys a comfortable way to test all of these AIs, every player will have a different difficulty level. Therefore, player 2 will be very easy, player 3 easy, player 4 hard and player 5 will be very hard. In multiplayer games, all player spots not taken by humans will be played by a very hard ai player. Another important thing I have to add: At the moment, you as a player, can controll and see the AI players in singleplayer games. This is actually by intention as it allows you to see what the AI does, how it does it and what could be made better. If you see a mistake, you can actually try to help the AI in the battle against other AIs or yourself. Feel free to report issues and possible improvements, so we can enhance the AI further. As always, we will continue to work on the game and are looking forward to your feedback. And if anybody would like to make a cool, up to date video with the newest release to be published on this site, feel free to write me an email! PS: Upcoming changes: New main menu UI and the possibility to play the original maps! I’m happy to tell you that we’ve made a new release version of the game. You can download the packages of Alpha v0.1.3 here. Please also have a look at the installation instructions. Minimap options for displaying only soldiers / settlers / none; coloring the player’s area … (please note: buildings are not shown on the minimap at the moment). Additional menus: You can now see the amount of each material you have. Improved menus: The building menu now displays the number of buildings you have and the number of buildings in construction. Mining has been reworked to behave more like in the original game. Mines now also display their current productivity. Amazon Demo files are now really working for the game. We hope you enjoy the game! If you have any trouble, please let us know (preferably as a ticket on GitHub/JSettlers or write me an email, post a comment if you don’t have account on GitHub). JSettlers is Open Source, First Alpha Released! UPDATE 26.04.2015 22:47: New release with some bug-fixes and an easier installation. Furthermore, new Java OpenGL libraries should improve rendering on more platforms. UPDATE 07.04.2015 22:47: I just published a new release with some bug-fixes. I’m happy to announce that the source code of our Settlers 3 remake is now fully available on GitHub. The repository can be found at https://github.com/jsettlers/settlers-remake. Please read the README.md for an installation guideline and a developer guide, if you want to assist the development. There you can also download the first alpha release of the game. Before you start the game, have a brief look at the manual, as there are some extra features in the UI, you should now about. Also note that you will need to have an original version of “The Settlers 3” installed on your computer, as this game is using the original graphics and sounds. This game is only in an alpha status! So be aware of bugs, missing features (no AI, only Romans playable, missing buildings…), an “unfinished” UI and frequent code changes possibly breaking your savegames. I’m looking forward to your reports and help in improving this game! I’m still looking for a good name and I’m open for your (serious) proposals. When following the installation instructions for JSettlers, you will also get the Map Editor installed. Feel free to design great maps and send them to me / commit them to the repository. I will try to update / improve the documentation more and more. If you have a special request / see a certain need, let me know! Best regards, have fun with the game + many thanks for your patience! Hey together and a happy new year 2015! Therefore I am currently working with him to get the project open sourced! After we open sourced the code, I will continue working on the project and hopefully we can push it further with the help of some of you guys! At the moment, we are removing some copyrighted pictures from our version control (which requires some code changes) to be able to open source the code. I hope to finish this process soon. Best regards and many thanks for your patience and continued support! However, obviously the progress isn’t as fast as many of you and me would like it to be. This is caused by insufficient time resources on my side and especially on Michaels side, who mainly works on the UI. But just to be clear, the current game only contains the Romans and has not all of their buildings. For example there are no monks and ships. But the food production, mining, heavy industry as well as the soldier production are working. Multiplayer matches via Internet are also possible, but the UI lacks many features and isn’t kind of “ready”. We will work on this and I just got news from Michael, that he’ll also be able to work more on his part. So much for now. Please excuse that I’m not that used to posting more often. I’ll try to inform you better and more often! Best regards + much fun with the screenshots (about 12k Settlers were living in this game). 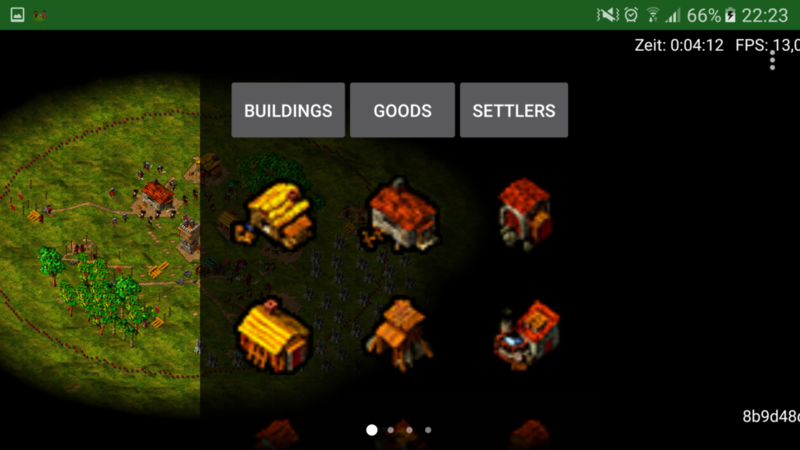 Finally we were able to create a new video of our Settlers III remake on an Samsung Galaxy S3. This time, not only the quality should be better, than the first time, but we also show some battles! If you enjoy our work, share and like us, so that others can also find our project. For easy creation of new maps and to change existing maps we developed our own Map Editor. Watch the video and for more infos take a look at The Map Editor. After about one year of development we are proud to show the first gameplay video of our Settlers III clone / remake on Android. For more information see our Project Description and Screenshots section. Copyright © 2019 Unofficial Settlers III Clone for Android, Mac and PC. Powered by WordPress. Theme: Accelerate by ThemeGrill.